As someone who appreciates gothic culture and mindset, Inky immediately won me over with her monotone voice, dark clothing and color palette, and aspiring talent for fashion. For a long time, I wondered why such a dark and seemingly depressed pony would be present among a bright and happy setting of pastel colored ponies, pegasi, and unicorns, until I came to the conclusion of- well why not? Put it simply, variety is the spice of life, and there really doesn't need to be any more explanation than that. But since the analysis community of the g4 fandom effected me since long ago, and it's not any fun to just leave it at such a simple and easy conclusion, I'm goig to analyze the hay out of this imaginary goth horse and try to reason on why she's like this! Starting with an easy one-a line from Hoity Toity seems to imply that Inky Rose is, in fact, depressed, when he says "If buttons can convey sadness, you nailed it." Now, it would seem that a bit of research on the symbolism of buttons would confirm this. Buttons are usually closely related to clothing (as seen in excess on Inky's Garment in "Honest Apple"). In films they are often used in sexual scenes as the people unbutton their clothing. So while it can relate to sexual intimacy, it can also be the opening of oneself emotionally to another, to revealing something personal, as if unbuttoning, or covering/ protecting / securing if buttoning up. Buttons can sometimes represent restriction or tight moralism as when one is buttoned up tightly. But it could be a way of saying ‘button your lip’ meaning do not let anything out – do not speak. Seeing as Inky Rose had so many buttons on her garment, I would assume that she is a mare with much to keep hidden, emotionally, and has a lot of sadness in her life that she's afraid to let show. The fact that she's later looking awkward and tense when she smiles, as if she's not used to it, seems to solidify this theory. But when Apple Jack complains that there are too many buttons on her garment, Inky reacts with hestiation, as if afraid to remove the buttons and symbolically reveal a side of herself through her art of fashion that leaves her more bare, exposed, though she does comply with AJ's "practicality". Furthermore, the color of her preference, black, is telling. Applejack complains and criticizes this about her, and says that all the black in her outfits is depressing. And while that may be so to some (not me, as pretty much my own entire wardrobe is black), its all how you interpret it. Black is a color that has many different connotations. It can be seen as threatening or as mournful, but, like all colors it has positive and negative aspects. Black is linked to power. It’s an intimidating color that shows that the person wearing is setting themselves apart from others. It’s a color that indicates strength and discipline. Black doesn’t usually express many emotions, rather, it conceals them, giving the person in black an air of superiority. This is a color that is considered to be quite elegant and simple at the same time. A black outfit can be seen as more fancy than a colorful one. It’s a color used for special occasions. In the Western culture, black is the color related to death and mourning. Black is seen as a grim color that reflects the severity of a loss and the pain people are feeling. It’s a very serious color that expresses grief. Black is a color to be used with caution, as it’s positive aspects often are closely linked to it’s negative aspects. Black suggests power, elegance and style, but also intimidation, aloofness and limited emotion. It is a color often linked with the idea of evil. 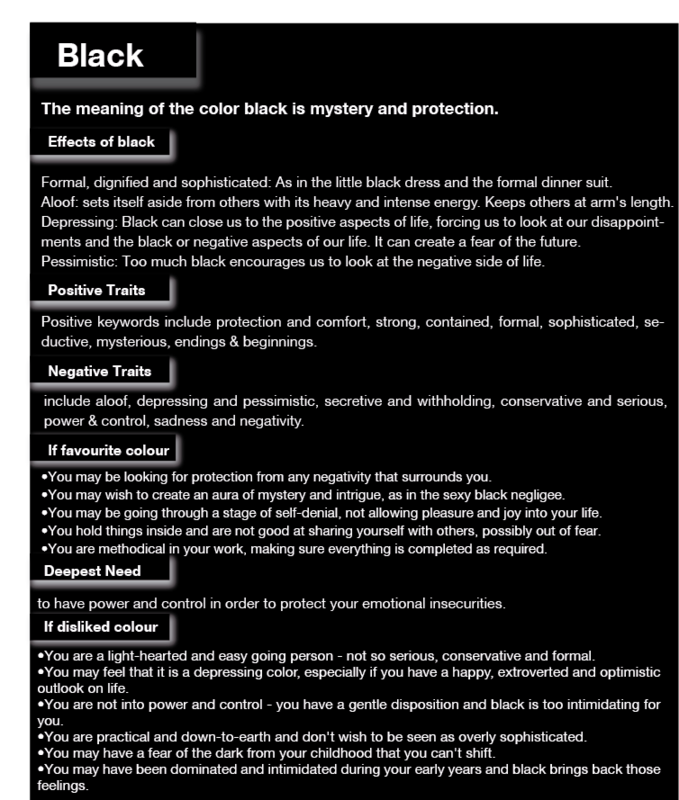 Black is related to mystery and concealment. It is also a serious color traditionally used to show one’s grief. 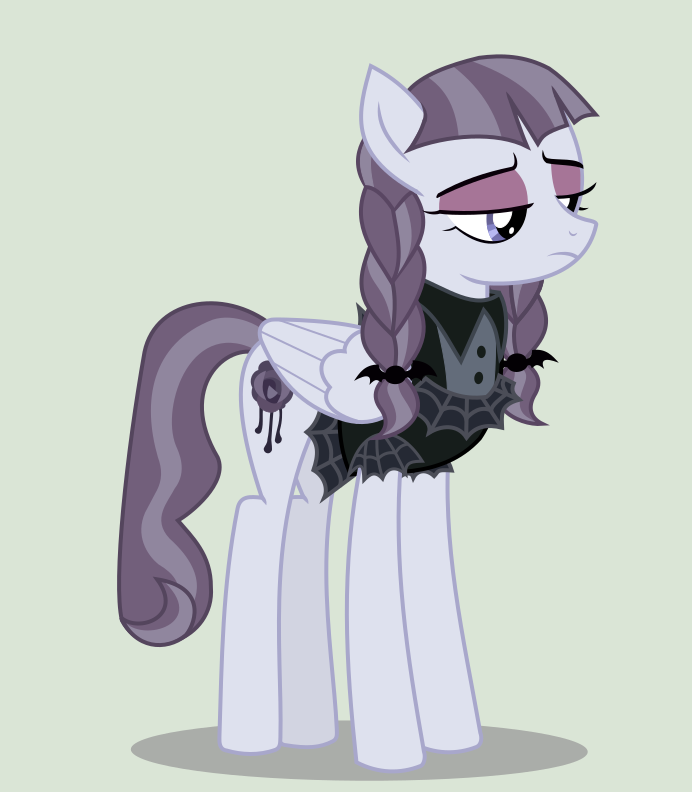 So along with the buttons, I get the sense that this pony has a lot of emotional issues that she wants to conceal in black-whether in the shadows of her past or in a deep, void within her, like a hole. Or perhaps blot out undesirable occurrences in her past with ink and make her future beautiful like a rose. She desires to suppress her emotions on an emotional basis, but still convey them through her artistic vision. However, Photo Finish judges just from Inky's stare, that she "Has a very focused vision. A strong sense of what (she) wants." So its possible that whatever happened in this pony's life, she could be on a course to recovering from it. Like the spiderwebs that adorn her clothing, Inky could symbolize being a pony who appears to be fragile and delicate, but strong and resilient at her core. I would look forward to seeing Inky Rose in a future episode of FiM, perhaps with lines, to get a clearer sense of her character and past.